This is a slightly updated post from last year, but now that the Deseret News is bringing people in droves to hear my inspirational ditty, I thought I’d provide a link at the top of the page for those looking for this little gem. So, yes, it’s that time of year again, and I figure my dozens of loyal readers of this blog deserve a gift as compensation for your pain and suffering. Before you get it, however, please indulge me as I provide a little background. Several months ago – 551 days ago, to be precise – I took the advice of many of you and put a bunch of my songs on iTunes and other online music stores. I created an album, titled it Stalker Tunes, gave it a weird, altered-Yul-face cover, and then uploaded a bunch of my demo tracks and waited for the money to roll in. I figured I should at least get enough to cover expenses, as it cost me $50 at tunecore.com to get my album online. 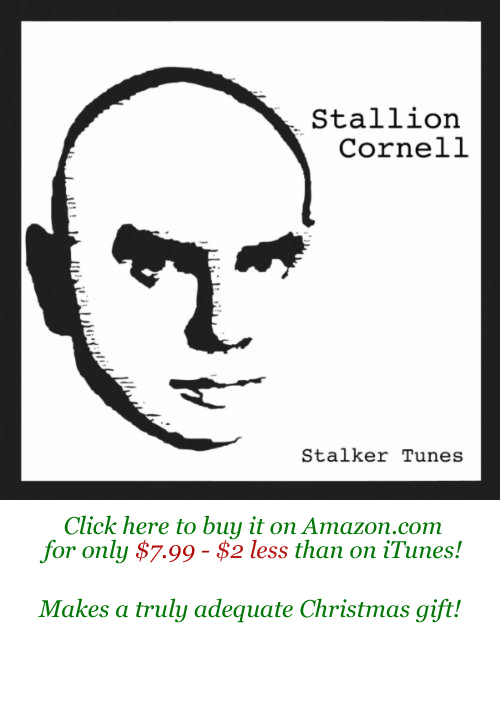 I figured there were somebody might be interested, or maybe there were some weirdos who download goofy songs from albums that have Yul Brynner’s face on them. My song “I Am a Cow” has sold one copy on iTunes, and it’s streamed 14 times on Spotify, and I get a penny per stream. (Inexplicably, it seems especially popular in Great Britain, where one p is worth 1.5 cents!) My song “Avalon” has streamed once; “Bad Lovin'” has streamed once, and “Bright Yellow Can (The Mustard Song)” has streamed twice. The links to those songs no longer work, as I stopped paying $50 per year to get $.80 in annual revenue. The flute really brought it home for me!